With the forthcoming release of the THE DARKEST HOUR I thought I would go back and watch the other Churchill film released last year. Directed by Jonathan Teplitzky (THE RAILWAY MAN) with a script by historian Alex von Tunzelmann (INDIAN SUMMER), this version stars Brian Cox in the eponymous role, Miranda Richardson as his wife, MAD MEN's John Slattery as Eisenhower, Julian Wadham as Monty, James Purefoy as the stuttering King, and Ella Parnell as the obligatory pretty young secretary who exists in the script merely to show Churchill his humanity. In contrast to many more blustering biopics, this one shows Churchill exhausted and troubled at the end of World War Two. It opens with him imagining bloody waters washing up on the shore of a beach, and the film's conceit is that he is so traumatised by his failure at Gallipoli that he is irrationally against another amphibious landing - Operation Overlord - that we, with the benefit of hindsight, will be a massive success. 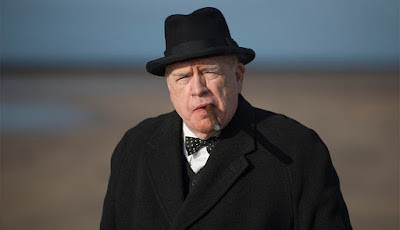 The resulting film is thus one that shows us a Churchill who is vulnerable, admirably guilt-ridden by his mistakes and mindful of the human cost of war, and physically exhausted. It also gives us a Churchill frustrated at being a mere politician rather than a commander, facing danger with his troops. Accordingly, he comes across as similar to the Queen, in The Crown season one, frustrated that his role is to NOT go to the frontline or put himself in danger, but to exist, to survive. Brian Cox is convincing in the role, giving his Churchill a nuance we rarely see on screen. Miranda Richardson has less to do in the trademark Clemmie hairdo and poor Ella Parnell in that sexist role of wide-eyed naive girl. I very much liked the direction and the landscape photography of the beach in particular. "I have presided at a series of meetings at which either Ike or Bedell has been present, and I am satisfied that everything is going on well. Ike and Bedell will probably tell you they are well pleased. I am hardening very much on this operation as the time approaches, in the sense of wishing to strike if humanly possible, even if the limiting conditions we laid down at Moscow are not exactly fulfilled. I hope a chance may come for us to have a talk before long. Every good wish." So CHURCHILL is an interesting film about a vulnerable man. Whether or not you enjoy it depends on how far you care that it's not true. CHURCHILL has a running time of 105 minutes. It was released last year and is now available to rent and own.